Akademie Street’s accommodation is the perfect place in the Cape Winelands to enjoy peace, privacy and tranquillity with personal attention from the owner managers always available. 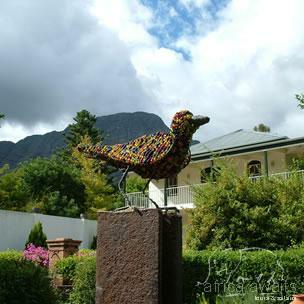 Franschhoek is the wine and gourmet capital of the Cape but is less than an hour from down-town Cape Town. Gelatenheid is a gloriously spacious double storey guest house with a wide balcony and superb mountain views over the Franschoek Winelands. It has an extra large loft incorporating the bed/dressing/sitting room with an extra length king size bed (or twin extra length beds on prior notice), TV and en-suite bathroom. This is guest house and boutique hotel accommodation at its most spacious. Vreugde is a garden suite that sleeps two. The bath and shower are separate, there is a small kitchenette and French doors open onto a wide veranda with a beautiful garden and small pool. Vreugde guest house offers both tranquillity and peace. Uitsig, a private upstairs suite, gives wonderfully comfortable, spacious accommodation. The French doors open onto a sun-baked balcony with a lovely view of the mountains encircling Franschhoek. One feels as if one is floating in the tree tops. The bath and separate shower are in an ultra modern bathroom with under floor heating. The king size, extra length bed can be replaced by twin extra length beds on prior notice. Twyfeling is a gracious Cape Dutch style house with a large living room and library and two large bedroom suites both incorporating the bed/dressing/sitting room with an extra length king size bed (or twin extra length beds on prior notice), TV and en-suite bathroom. This is Franschhoek accommodation at its most spacious. Twyfeling and Uitsig share a large, solar heated pool and gracious garden. 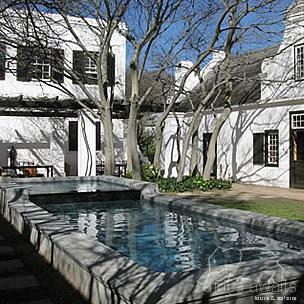 With your holiday, safari or business trip from in to Akademie Street Guesthouses in Cape Winelands.